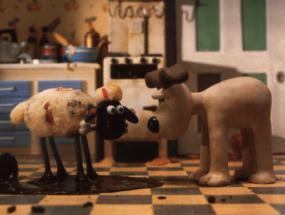 This collection of three of the best Wallace and Gromit shorts introduced Wallace and his dog Gromit to the international viewing audience. These simple, enjoyable stories are an excellent addition to any library of family movies. This short was originally released in 1993. It's Gromit's birthday, and he's not overly thrilled with the gifts he gets from Wallace: a studded leather collar and leash, and a set of mechanical trousers for walkies. Needing a bit of money to pay the bills, Wallace decides to take in a boarder. The boarder he gets proves to be more than Wallace bargained for, as he first takes over Gromit's room, and then takes over Gromit's household jobs in a clear attempt to replace Gromit in Wallace's affections. Miserable, Gromit leaves -- and leaves the way open for the boarder to pull Wallace in on his nefarious plot to steal a giant diamond. This short was originally released in 1989. The boys are trying to decide where to go on vacation when Wallace discovers that they are out of cheese. As everyone knows that the moon is made of cheese, they build a rocket and take their holiday on the moon, where they run into trouble with a mechanical device that protects the moon. It is not pleased with Wallace's slicing off bits of the moon and eating them up. When it tries to bash Wallace's head in with a bat, the twosome make a run for the rocket and escape back to earth with a basket of cheese. This short was originally released in 1995. The industrious duo is now washing windows to make ends meet. There is a wool shortage on, as well as a problem with sheep rustling. The owner of a local wool shop hires the duo to wash the shop windows, and Wallace is smitten. But Wendolene is protected by a huge bulldog, Preston, who doesn't like Wallace and Gromit. And then one night, Shorn shows up in Wallace's home. Shorn is a sheep, and what the guys don't know is that Shorn has escaped from the sheep-rustlers into their home. The boys must help Shorn break the sheep-rustling ring and save Wendolene from Preston before it's too late. A Grand Day Out was nominated for an Oscar in 1991. 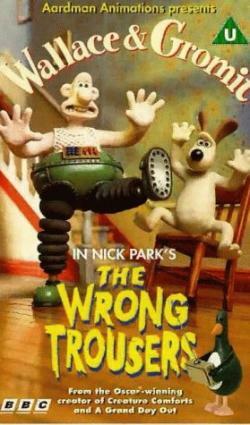 The Wrong Trousers won the Oscar for Best Animated Short Film in 1994. It also won and was nominated for a number of other awards in 1993 and 1994. A Close Shave won the Oscar for Best Animated Short Film in 1996. It, too, has numerous other nominations and wins to its credit. Claymation has been in existence since the invention of plasticine in the late 1800s, and the first claymation film was made in 1908. But with the advent of computer generated animation, claymation fell into disuse. Wallace and Gromit bring the art of claymation to a whole new level, and show that it still has a place, even in the computer generated era. This collection of shorts has been released under a number of titles.